Confidentiality is the state of being kept secret or private. It involves a set of rules on how sensitive information should be handled as well as the promise that these information will not be divulged to unconcerned parties and access to them will be kept controlled and limited. Today’s technology makes it easier for rumors to flit from someone’s lips to another’s ears so quickly. In this world of interconnected webs, the ability to keep a secret has diminished yet is needed now more than ever before. When confidential information finds itself in the wrong hands, things could turn out terribly. Sensitive information may be used to commit illegal acts that would cost the aggrieved party so much. 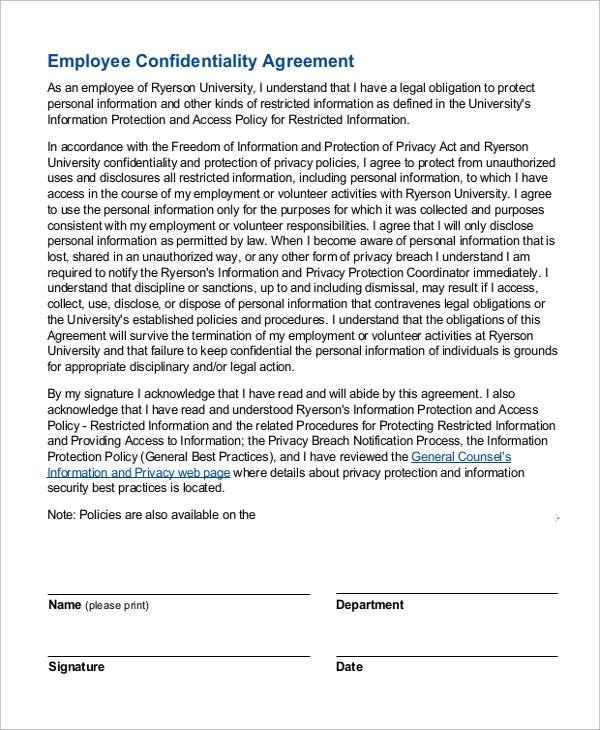 Due to this, it is easy to understand the necessity of a legal document that would assure us that someone who breaches a trust of confidentiality will be held liable. 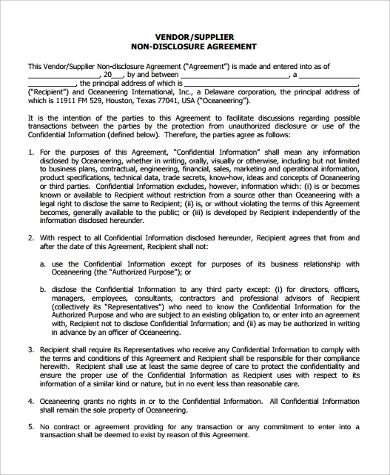 If you’re considering entering into a confidentiality agreement, see these Sample Agreements and read on for some things you might need to know before you sign above the dotted line. The relationship between lawyers and their clients is based on mutual trust. The lawyer trusts that their client will truthfully answer the lawyer’s questions and that the client would tell the lawyer every relevant fact concerning the case. The client, in return, trusts that the lawyer will not divulge these information to anyone or use what information they’ve gathered to incriminate or harm their clients in any way. 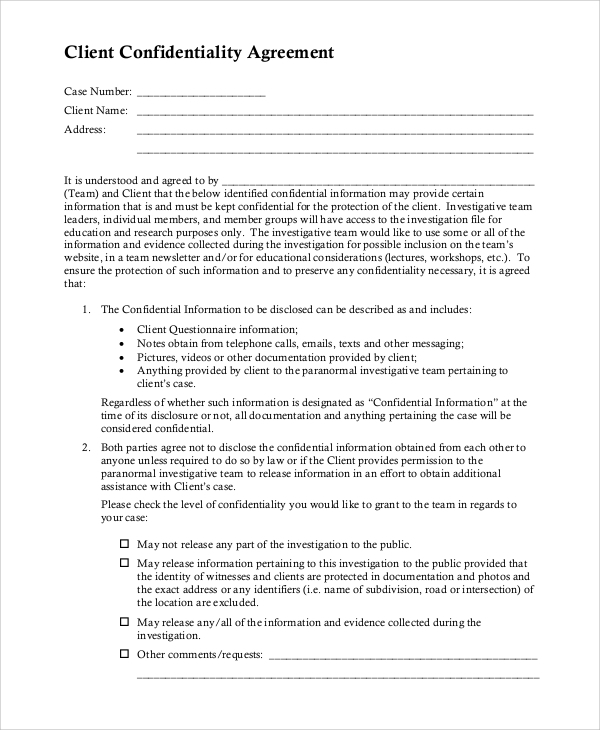 Clients could rest easy knowing that their attorneys are bound to them and, legally, have to keep mum on any information the client wishes to be kept a secret. The promise of confidentiality helps foster an environment of trust during a counselling session. Ethics prohibit psychologists, therapists, and counselors to divulge any information that the client may share with them. 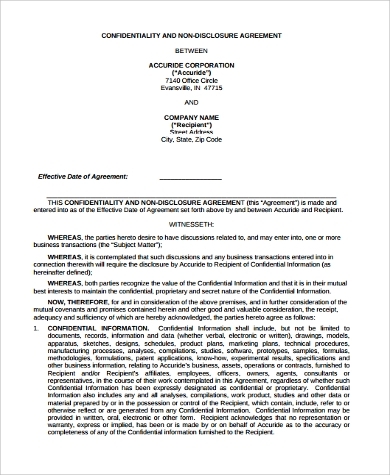 However, this confidentiality agreement only holds up to a certain extent such as when it conflicts with the therapist’s duty to warn and protect. 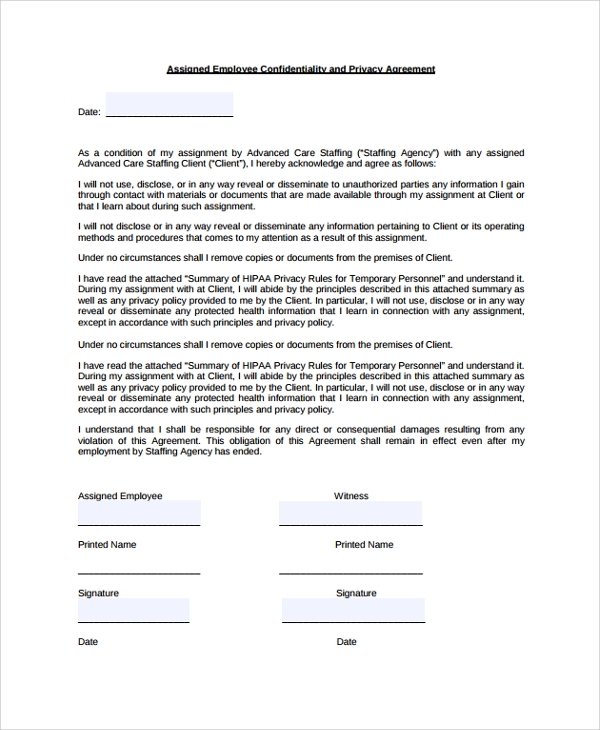 See these Sample Personal Confidentiality Agreements and Sample Employee Confidentiality Agreements for more. 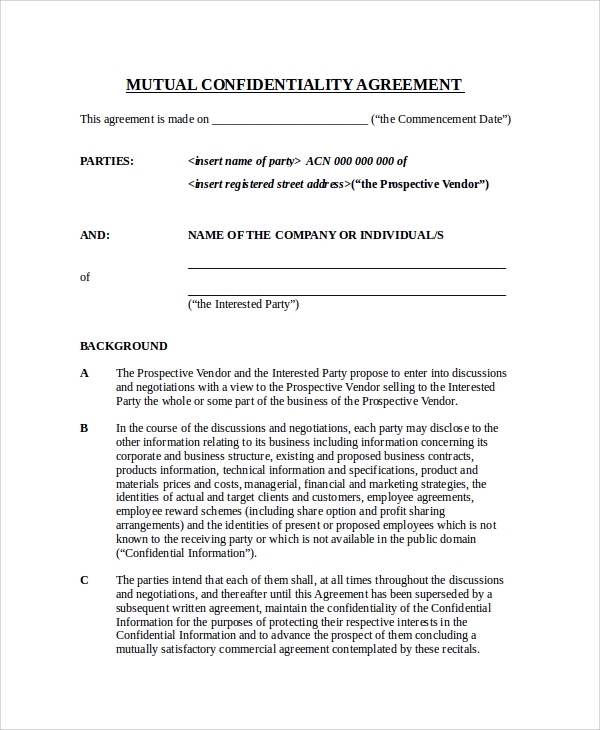 Confidentiality agreements are a legal contract entered upon by two or more parties. This contract outlines sensitive information, knowledge, or material that those involved wish to share with each other for a certain purpose. 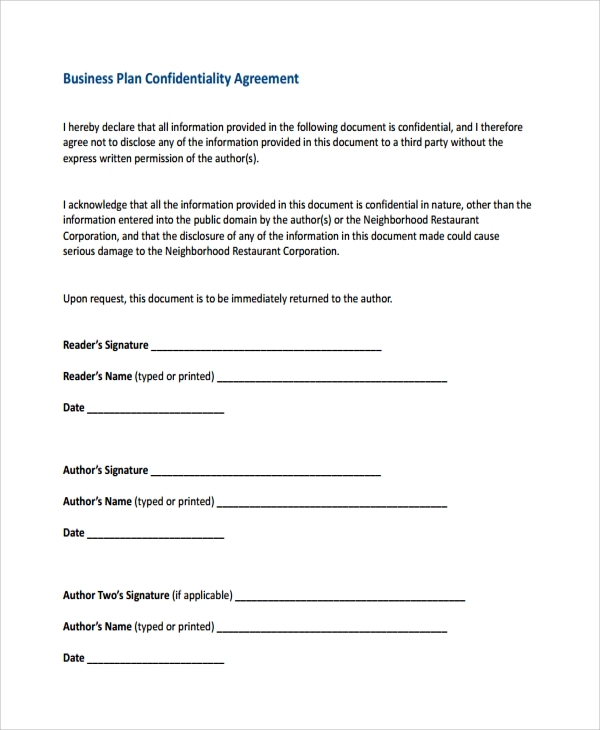 These agreements are signed to ensure that secrets are kept secrets. 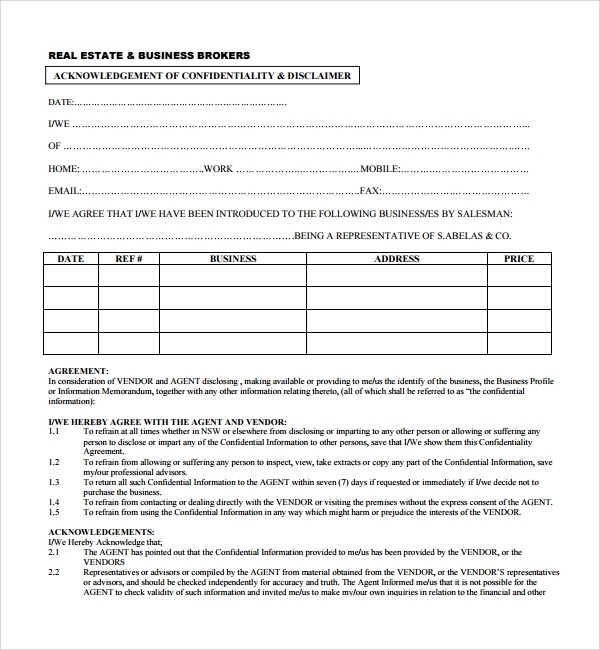 Before signing a confidentiality form, it is important to thoroughly read the entire document, including any fine print that may be there. Make sure to take note of the disclosure period, types of permissible disclosure, clauses that could terminate the contract, and what are the consequences should the contract be breached. If there is anything in the contract that you do not understand, it is best to consult a lawyer. 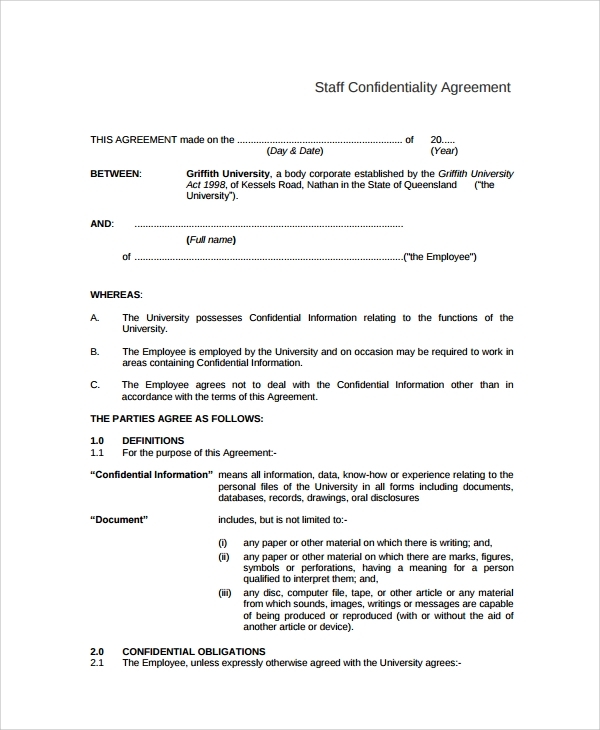 See these Sample Confidentiality Agreement Forms as a guideline for drafting confidentiality contracts.